Check out our NEW items: Organic Linen Socks in an ankle style -- perfect for summer, an Organic Linen Infinity Scarf - great for year round wear, and Organic Linen Hats for both men and women. Linen is a natural fiber made from the stalk and root of the same flax plant that produces flax seeds. Flax seeds are not only edible but very beneficial to health (they may reduce the risk of heart disease, diabetes, and cancer), so it logically follows that fabric made from flax plant stalks would also be highly acceptable to the body. 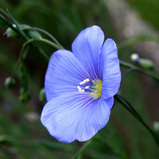 Production of flax is both environmentally friendly and sustainable requiring less pesticides and herbicides than what other plants like cotton require. New to linen? Start with a pillowcase! Who Can Benefit from Linen? Unlike cotton which holds water next to the skin, linen is very effective at absorbing moisture and wicking it away from the body. This is very important for any material worn next to the skin. This is helpful for night sweats, hot flashes, yeast infections, and helping keep toxins away from the skin. The antibacterial effect of linen may help with urinary tract infections. Linen is beneficial in hot temperatures because of its natural cooling effect, and is hypoallergenic and gentle on the skin. Linen has been the quality fabric of choice for thousands of years of history. Linen is one of the oldest cultivated fabrics. It has been known as a natural, pure product. In many cultures, the priest garments consisted of pure, white linen. 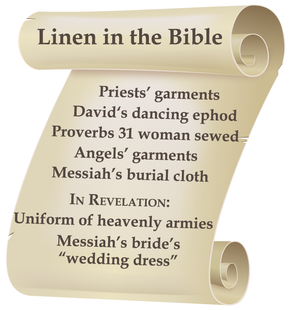 Why Life-Giving Linen? We believe what we put on us affects our health, just like what we put in us. Our family has been committed to healthy eating and organic living for many years. For more information about our family see our About Us page. Our interest in organic clothing is an extension of this lifestyle. We are committed to living without toxic chemicals whenever possible. For instance, all pre-washed linen is washed ONLY in fragrance free/dye-free, phosphate free laundry detergent. Click here to be added to our occasional newsletter mailing list.